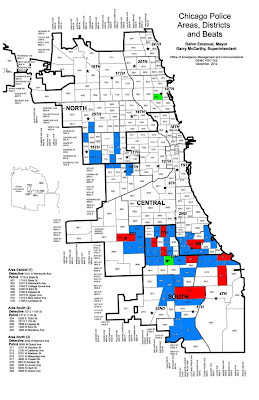 Out of the 274 police beats in Chicago, Wrigleyville and Boystown's beat 1924 ranks #10 in overall violent crime reported in the past 90 days according to the Chicago Police Department's CLEAR Map web site. Violent crimes are the most serious classification of crime, comprised of homicides, criminal sexual assaults, robberies, aggravated assaults, and aggravated batteries. Lesser incidents such as fist fights (simple battery), and property crimes such as burglaries and theft do not factor into violent crime statistics. This CWB graphic shows the 50 most violent police beats in Chicago. Red denotes the 9 most violent beats. The green beat to the north is our neighborhood's beat 1924, which tied for 10th place with the green area to the south. The blue areas are the rest of the 50 most-violent beats, all of which are "less violent" than beat 1924. There have been no homicides in Wrigleyville or Boystown since March 5, 2012 and there has been only one shooting since 2011. While aggravated batteries, led by stabbings, have been on the rise in recent years, "agbats" are a relatively minor contributor to our violent crime count. This area's shockingly high violent crime rating is driven by one factor: Its out of control and unaddressed robbery problem. 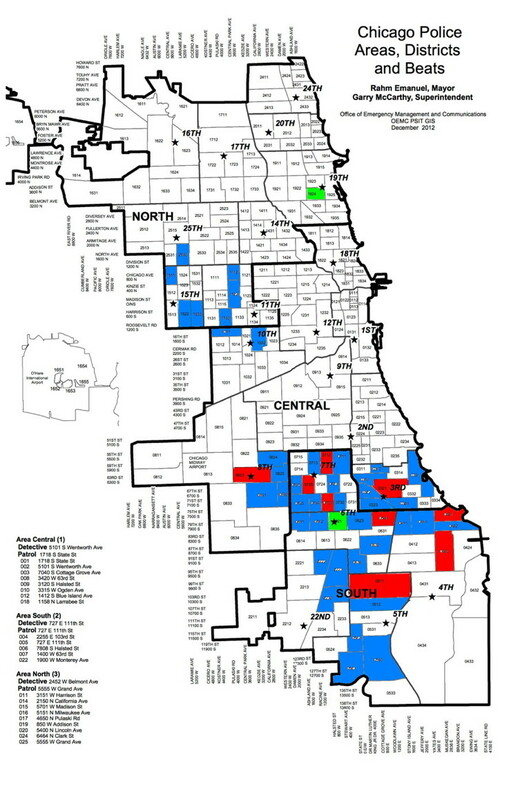 The problem is so bad, Wrigleyville and Boystown's beat ranks #1 in the city for robberies over the past 90 days. For the past 365 days, beat 1924 ranks #5 for robberies and #26 for violent crime. Our concern, and hopefully yours, is that criminals know that our neighborhood is a fertile field. Since robberies have been allowed to bloom for years without serious consequence, bad elements are not likely to see any reason to behave when it comes to lesser matters. Or, unfortunately, greater ones. UPDATED 28 JULY 2013: Polished. Added close.